As we’ve seen above the Flex SDK requires Java 1.6+ in order to compile. This isn’t standard with Windows, so unless you are a Java developer and have a Java IDE installed such as Eclipse or Netbeans, you’ll need to download and install Java first. You need Java Platform SE (SE standards for “Standard Edition”). The current release is Java SE 6 Update 24, but any newer version should work just as well. Download the JRE (Java Runtime Environment) version. Get the 32-bit version, even if you run a 64-bit version of Windows. Install it and disable all of the annoying Sun Java update alerts. Download and install FlashDevelop. I’m not going to screen shot the whole process, because to be fair if you can’t click “Next” a couple of times then you’re probably not yet ready to be coding games. The only important thing to note is this: When FlashDevelop asks you if you want to download and install the Flex SDK – SAY YES! 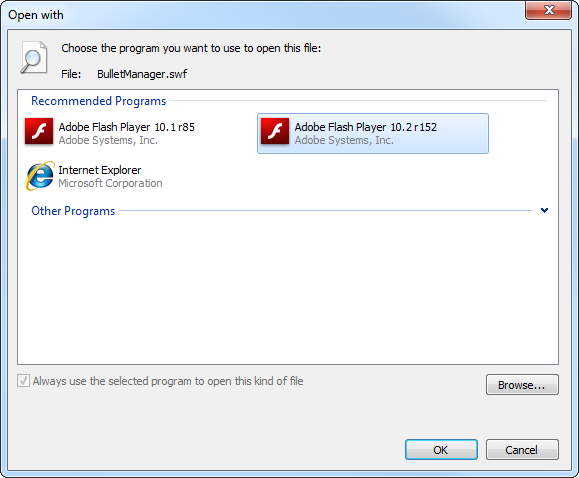 Flash Player is typically installed as a plug-in in most web browsers. This means if you drag a SWF file onto your browser, it should play. This is a less than ideal way to test your games though, so we’ll download the stand-alone Flash Player in two versions: Release and Debug. If a later version of Flash Player is available when you read this, get those instead. You will now have 2 EXE files. Copy them somewhere you are not likely to accidentally delete them! If you drag a SWF file onto either of these new Flash Player exes it will open and play. The reason for getting both is that one is the Debug Player, and the other is the Release Player. 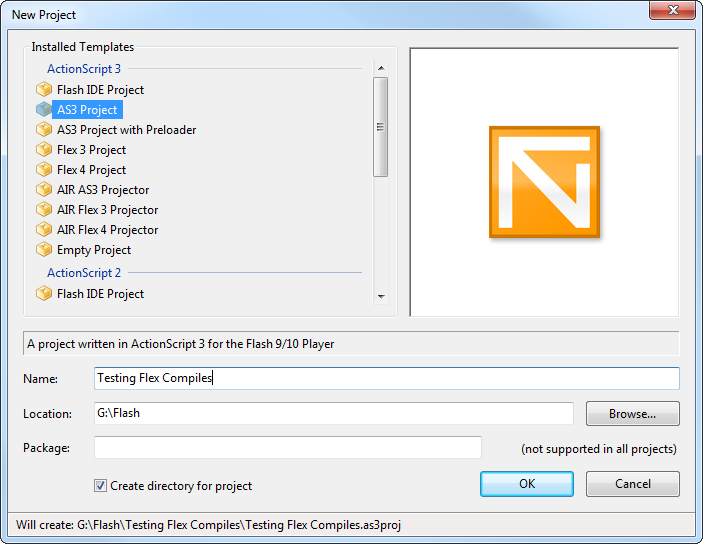 The Debug Player (the one with _sa_debug in its name) contains the ability for your games to throw run-time errors, view redraw regions and report back to the Flash Debugger (fdb) that FlashDevelop uses. This last part is vital for your sanity, as it will report and catch errors during testing back to you (where-as Release Player typically fails silently). You should always develop using the Debug Player, and then test it on the Release Player before you go live. Release Player will give you a free speed-boost, as it doesn’t contain all the debugging baggage, so it runs quicker. It’s also what the majority of people seeing flash on the web are using. If your game is running a little slow under Debug, it may well be fine under Release. Click on the “Browse …” button and then select the Flash Player Debugger EXE you just downloaded. Make sure that “Always use the selected program to open this kind of file” is checked and click OK. Once you’re done it will look like the above window. 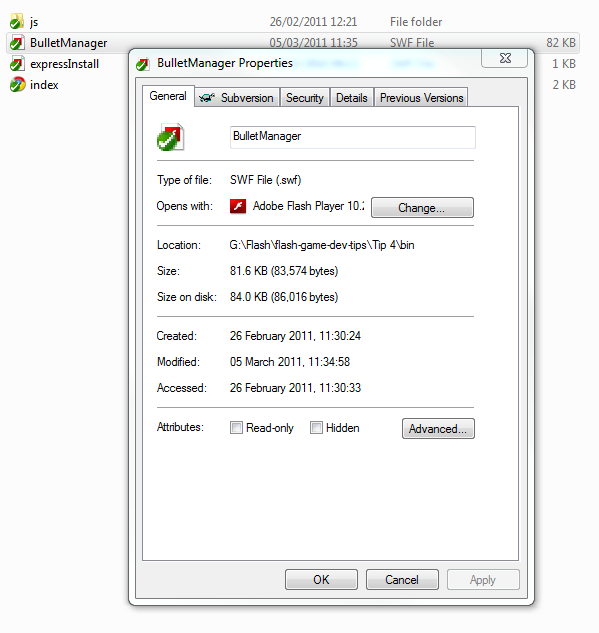 And what’s more, double-clicking SWF files will now automatically launch them into Flash Player. Don’t worry, this action won’t change the way your web browser runs Flash. That will still work in the same way. Adam (the creator of flixel) keeps the source code on github.com – a social source sharing site. There are 3 branches of flixel at the moment: Master, Dev and Beta. Currently version 2.5 of flixel is in dev and beta, but will soon be pushed to Master (where the final release versions sit). For now let’s get the 2.5 release from the beta branch. .. and click the big Downloads button, and pick the .zip package. You’ll have a new zip file ready for use in a moment. You now need to decide where you want to create all of your Flash projects. I personally have a folder called “Flash” on one of my drives, which is then broken down into “Games”, “Demos”, and various other things. For the sake of this tutorial I’ll assume you have picked somewhere to keep all of your work, and I’ll refer to that place as your Projects Folder. 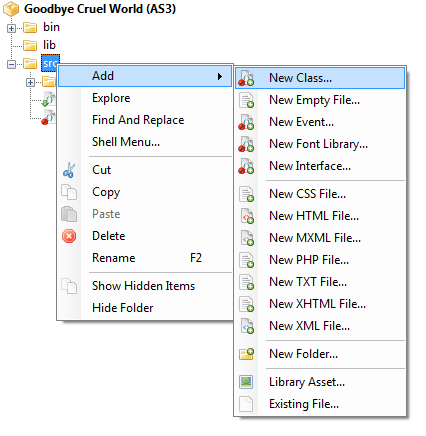 Extract the flixel zip file you just downloaded into your Projects Folder. It will create a new folder called AdamAtomic-flixel-719aabe – rename it to “flixel 2.43” (for your sanity more than anything). 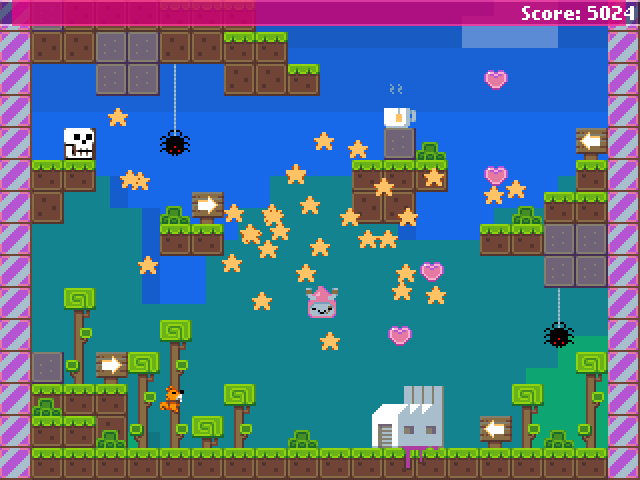 You’ve now got the latest release of flixel. In the docs folder you’ll find documentation. In the org folder is everything we’ll need in a moment when we create our first flixel project. Note: If you know that FlashDevelop works fine on your PC, skip this step. Select “AS3 Project”, give it a Name (I used “Testing Flex Compiles” above) and set the Location to be your Project Folder. Have “Create directory for project” ticked and click OK. It may now prompt you for some details, such as your name, fill them in once and it will remember them. Obviously you don’t have to create these 3 folders, but I would strongly recommend you do create an assets folder. The difference between assets and psds is that psds for me contains all of the work in progress graphics and Photoshop files. Where-as assets contains the PNGs exported out of Photoshop, for final use in my game. If you expand the src folder you’ll find a file called Main.as inside. Double-click it to edit it. What we are doing here is creating a new Sprite called redbox, and making it look like a 100×100 pixel sized red square. We then add it to the display list so it renders. Press F5 and FlashDevelop will compile and try to run your SWF. If all has gone well (no typos, no set-up mistakes, etc) then Flash Player will open with an 800×600 sized white window, with a red square in the top left of it. Ok so it’s hardly Super Mario, but everyone has to start somewhere right?! 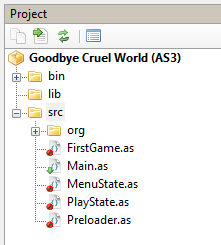 Create a new FlashDevelop project, but this time pick the Project type “AS3 Project with Preloader”, call it “Goodbye Cruel World” and click OK. 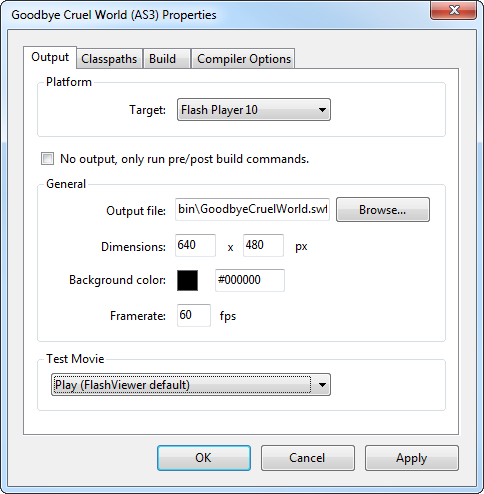 This told FlashDevelop that we want our game to be 640×480 in size, have a black background by default, run at 60 frames per second and that we’ll test it in the Flash Player associated with SWF files (which we set-up earlier). Now remember that zip file we downloaded from github? The one actually containing flixel? Go back to where you extracted it and copy the org folder into the src folder of your new project. Do NOT include docs, build_docs.sh, flx.py or license.txt. Just take the org folder and nothing else. It’s very important to note the structure here. The org folder is sitting at the root (the top) of the src folder. This is vital. If you have it located anywhere else it’ll fail to compile. In the shot above I’ve expanded out the org/flixel folder so you can see the contents. You’ll also notice the Main.as file as before, and a new Preloader.as file. In the panel that appears ignore everything other than the Name (which will default to NewClass). Change it to FirstGame and click OK.
Repeat this process again, only instead of calling the class FirstGame, call it MenuState. Repeat the process one final time, and call it PlayState. When the SWF is loaded into Flash Player the code in the Preloader will run. This will carry on running until the SWF has fully loaded. At this point the class Main gets created. Main in turn creates a new class: FlxGame – this is the start-up class for flixel, it tells flixel what size your game is, if it should be zoomed and which state to run by default. FlxGame then calls the FlxState you nominated, and things kick off from here. Technically Main and FlxGame can be bundled into the same class file. I don’t like to do this personally as I’ll explain in a future tutorial, but there’s nothing wrong in doing so. Right, time to put some code into those files we created! This is the default file as created by FlashDevelop, with two extra lines. It waits for the pre-loader to have finished and then it creates a new local variable called game, which is an instance of the FirstGame class. This is then added to the display list. In short, it’s just made your flixel game visible. Quite simply this creates our FlxGame instance. The call to super takes 4 parameters. The width and height of our game, the FlxState to call when FlxGame is ready, and the zoom level we’re running at. v2.5 of flixel also added 2 new parameters: the frame rate of your game, and the frame rate to set Flash Player to. It’s fine to leave the defaults for now. In this case our SWF dimensions were 640×480, but the size set here is 320×240 with a zoom level of 2. So basically every pixel is going to appear doubled-up in size, for that 8-bit retro style 😉 MenuState is the FlxState that will be called first. This looks more complicated, but all it’s actually doing is creating a button that the user can click to start the game. FlxStates have a function called create which you must over-ride and then fill with your code. 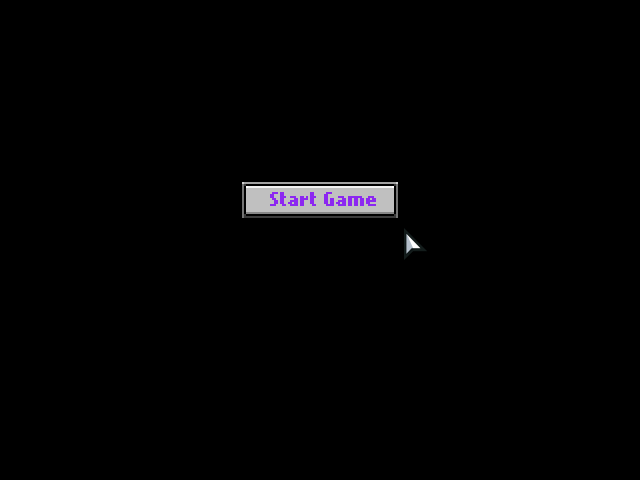 In our case we’ve told flixel to show the mouse pointer and create a start game button. Look at the flixel documentation for details on what all of these things do. Or, as you’re now cooking with the power of FlashDevelop you can get context-sensitive help on most flixel functions by simply clicking inside of the braces and pressing CTRL+SHIFT+SPACE. You’ll see a pop-up like this, and as you move along through the parameters it’ll tell you what each of them do. Here we create one single FlxSprite and add it to the display. As we’ve not loaded in any graphics this will appear as a small flixel logo. It’s not much, but it lets us know that our MenuState is hooked to our PlayState correctly. Press F5 to test your game. And clicking Start Game will show a black screen with a small white square in it. You’ve also got a good FlashDevelop template here to use for future games. Just copy the whole project folder, rename it and you’re good to go once more. To learn about the Flex 3 compiler design there is a great white-paper on the Adobe site. To understand how mxmlc works, read this article by Senocular. 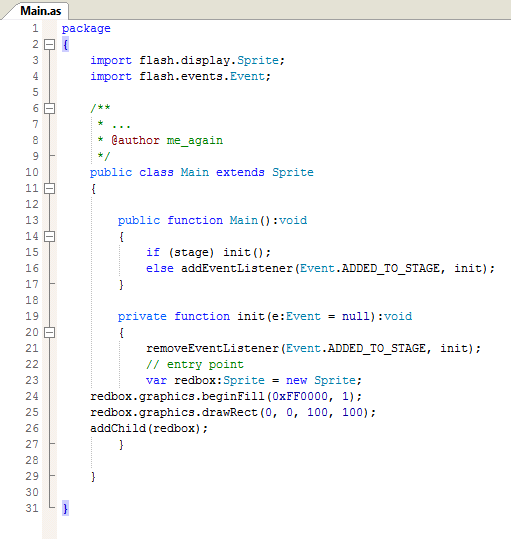 A Beginners Guide to FlashDevelop is a great article if you want to learn more about what FlashDevelop can do. And the Flash Game Dev Tips Google Code Project page contains lots of other tips you can use with your new-found flixel skills. Posted on March 22nd 2011 at 10:55 pm by Rich. In the installation notes for FlashDevelop it says you need TortoiseSVN or TortoiseGit for using the source control plugin. I didn’t get it but was just wondering if it’s a good idea to get, and what the “source control plugin” is for? Great, that’s surely a big help for all FlashDevelop / Flixel beginners! 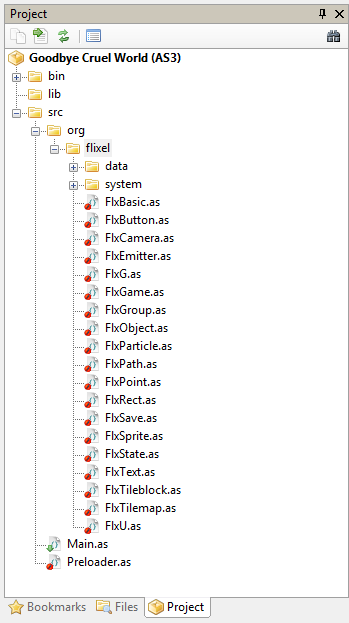 Just unpack the archive into your FlashDevelop\Projects directory, and then instead of creating an “AS3 Project”, create an “AS3 Flixel Project”. Saves you several steps of this tutorial, like downloading and unpacking Flixel source code and creating the typical game classes. And it can easily be repeated for new projects! Thanks. This was a fantastic tutorial from start to finish. It’s the time. Thanks a lot! Hi Daniel – Glad you liked it. It does say to “but this time pick the Project type “AS3 Project with Preloader” and it then goes on to explain that there will be a Preloader.as file created as a result of picking this. You don’t need to put any code in it (at this stage) because FlashDevelop fills it out for you. When you come to customise the preloader, then you need to change it (but that’s a little beyond the scope of this tutorial specifically). Error: The private attribute may be used only on class property definitions. The tutorial does say “Modify the init function so it looks like this” (the key word being “Modify”). [Fault] exception, information=TypeError: Error #2023: Class Preloader$ must inherit from Sprite to link to the root. Can’t you do this with Add Classpath? I’m having trouble adding the org folder to the src folder, could anyone help with a step-by-step? Thanks! Dean- I’m just learning all of this so I’m not sure how much authority I have on the matter, but when it came to adding the org. to the src. folder I clicked on the src. and chose to explore it. Then once the program files came up I manually added the org. Hope that helps (: and slight issue with my “game” I get the black box and everything when I F5 but there’s no button saying to start my game…coding matched up verbatim with what was in the tutorial. Anyone help? But I have a problem, In the part of “Create your first FlashDevelop Project” when it says “Press F5 and FlashDevelop will compile and try to run your SWF.” I do it but I have an error that says “This project doesn’t have a valid SDK defined. Please check de SDK tab in the Project Properties. Hope you can help me soon, I really want to make a game. Madpunch – sounds to me like FlashDevelop didn’t download and install the FlexSDK when it was installing. Either that or it did, it’s just not been set in the Project Properties. So go to there and pick the Flex SDK from the list (it should be the only one on it!). Thanks Rich – That was, when I downloaded Flashdevelop I selected the option to download flex but It didn’t. I downloaded from the web and now works fine, thanks for your help! Just did the tutorial… checked everything… got nothing but a black screen… not sure where I may’ve messed up… help/suggestions? When i try to compile “Your first flixel project” I have an error “The definition of base class FlxGame was not found.” in FirstGame.as file. Does anyone know what can be wrong? great stuff i must say. i’ve been searching for a thing like this for a couple of days now. i encountered a minor issue though. i’m using flex sdk 4.6 and flash player 11.3. when i compile, it was looking for playerglobal.swc 11.3 and i had to grab it at http://www.adobe.com/support/flashplayer/downloads.html. This is great – straight to the point, simple and well explained. Saved me hours of faffing and trying to work it out myself. Why isn’t there a link to this page on the Flixel website. It could replace that terrible ‘tutorial’ they have. I’m having an issue here, not sure if anyone could help given that it was Aug last year someone posted on here, but when I use FlashDevelop with the newest flixel, I’m not getting any of the syntax coloring or context-sensitive help. I’m having a silly problem with “override public function create():void”. I keep getting the error “Error: Method marked override must override another method.” I can see that create() is declared in FlxState and my “import org.flixel. *;” works for all other functions. Has anyone else encountered this problem? Thanks for any help offered. Update: I wasn’t extending from FlxState. All good now! Thank you, thank you, thank you for writing this. Thank you so much for writing this ^__^ I’ve always wanted to get into flash programming and now I finally understand it (almost). I followed the tutorial step by step. The first project worked fine for me. But when I launch the 2nd project, all I see is a black screen without the “start game”-button. any ideas/solutions to fix it? Thx! Do I need to know Flash coding to use that? This is a fantastic tutorial. I was completely lost when I first downloaded Flixel a couple weeks ago, and I was just about ready to give up. But then when I found this, I was able to get it running properly in no time at all. Thank you so much! Really great plugin to help understand how all the pieces fit together. It’s been a dream of mine to make games and I got an absolute kick following this tutorial. Very well made! Thank You. You’ve inspired me to keep on learning. I could understand some aspects of the code (even though it’s not a language that I know) because of my exposure to other languages like Java and C. Is learning ActionScript a necessity to continue fiddling around with Flixel? I can’t find any SWF files. any ideas?